Thanks for the quick reply Peter, much appreciated. This is an Araniella orb web spider, but there are 5 variable species found in Britain, which cannot be identified to species without examination of adults under a microscope. Yours is probably Araniella cucurbitina or A. opisthographa. They are harmless to humans. Can anyone help me identify this little fella / madam? Couldn't get them to turn around but stuck my head in the hedge and the abdomen was bright green on the other side with no other significant markings that I could see. 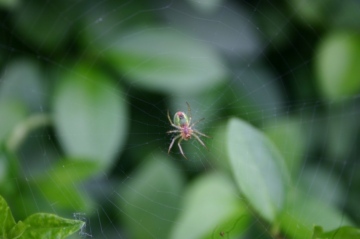 It was resting on a web on a privet hedge. Postcode is CV9 1DW and we are in Atherstone, North Warwickshire. Apologies for the lack of focus. Will try and get a better shot over the weekend if possible. Please can you provide your location as a full postcode or Ordnance Survey grid reference. 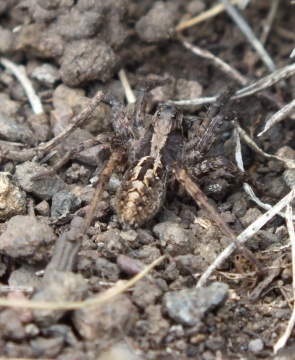 This is Pisaura mirabilis, the 'nursery web spider. The female commonly sits out on leaves, and is very variable. She carries the egg-cocoon in her jaws until the eggs are about to hatch, when she constructs a tent-like web in tall herbage in which young remain until they disperse. 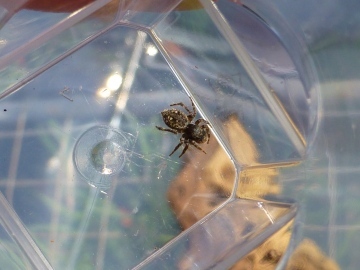 The spider is widespread in much of Britain, including in gardens. 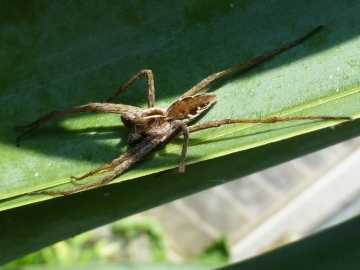 See summary and nursery web spider pages. 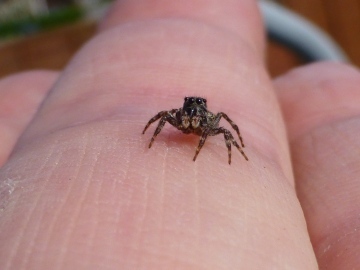 I found this one in my mum's garden, I think it's Episinus angulatus. Can I have confirmation/correction please? Bear with me, trying to work out how to post the blinking photo! Link below. If anyone can tell me how to post the photo so it appears in this thread, I would be grateful. Thanks! They both seem to be female, but it isn't possible to tell if they are adult or not. Many thanks for that. Is it ok then that I change the titles of my images to the species names now? Can the gender be confirmed from my images? Thanks for that. 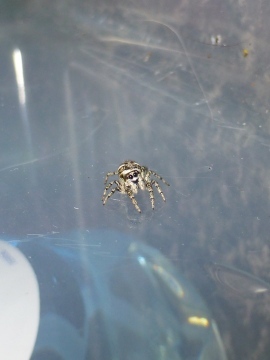 Your jumping spiders are the 'zebra spider' Salticus scenicus, see summary and Zebra Spider pages and Sitticus pubescens, a rather local spider found on walls and in gardens as well as occasionally semi natural habitats. Found these delightful little critters in the garden. I had been waiting for them to appear this year so as I could photograph them for identification and recording. 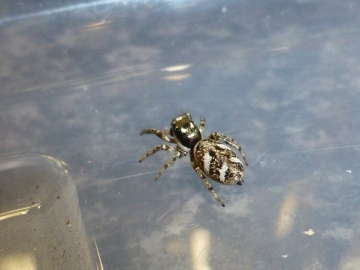 The dark abdomen one was approx 5mm and the striped abdomen one was approx 7mm in total overall length. Yes, no other British Alopecosa this could be. I always think this is a good indicator of a nice spider habitat area which might turn up more good species of sparsdely vegetated ground, lichen 'heath', etc. 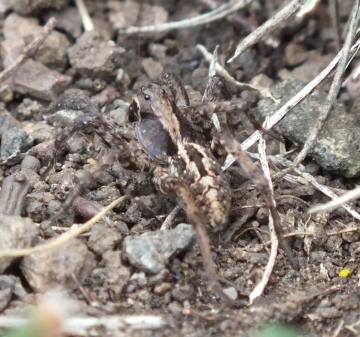 Re: Spider ID Help Please! This is a Tetragnatha orb web species. 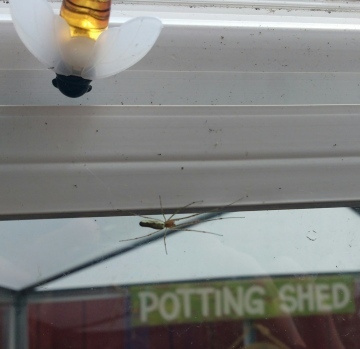 Just found this specimen sitting on my wife`s greenhouse in Burnley. Postcode BB12 8AD From a little research, he / she appears to be a Tibellus Oblongus and is apparently a "grass spider", which is odd as we have artificial grass! I may be off the mark with my identification, so if anyone can help, then please feel free to do so!